1. Skin the vegetables and in a standard food processor, grate them into a suitable bowl. 2. Take a handful of the grated vegetables and squeeze as much moisture from it as possible. Then place on a paper towel. Continue until you have squeezed out as much of the moisture as you can. 3. Clean and dry the original bowl and repeat the process of squeezing the vegetables dry but putting them in the bowl when finished. Then stir them to mix thoroughly. 4. In a separate bowl, beat the egg with the flour to form a sticky glue that will hold the latkes together. 5. Mix the sticky egg and flour with the vegetable mixture and form into flat pancakes about 3 to 4 inches in diameter then place on a cutting board. 6. Heat about 1/8 inch of peanut oil in a 10 inch cast iron skillet over medium high heat until a drop of water sizzles upon contact. 7. Place three of the pancakes into the skillet, press down with a spatula to thin them and cook until the edges start to turn deep brown. Flip them over carefully and cook for 2 to 3 minutes more. 8. Remove from pan and place on paper towels to drain excess oil. 9. Repeat until all are cooked and drained then place in a 175-200*F warming oven until ready to be served. 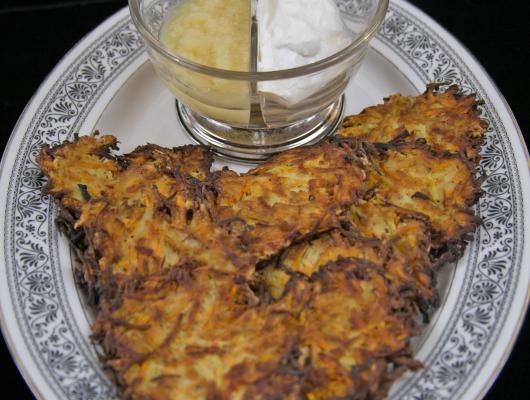 Latkes have been eaten for several thousand years all over Europe and the middle East. 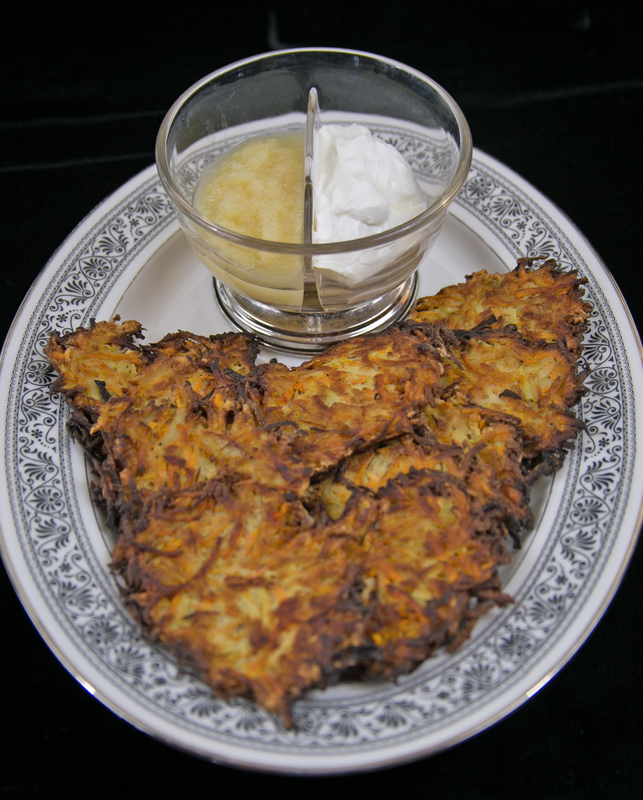 Modern latkes utilize more than just basic potatoes. They also can include sweet potatoes, yams, carrots, parsnips and other root vegetables that have been grated, combined with an egg and flour gluing agent then fried. They can also include onions, garlic or ginger as flavoring agents and are eaten with various dips including sour cream and applesauce. So they are a very interesting food and a part of many European and Middle Eastern cultures. We opted for ginger this go round.